Is it a sin for the central bank to help reduce debt? There is a great deal of discussion about the appropriate goals for monetary policy. Should it just be targeting inflation, or should central banks also include the output gap in their objective function? Perhaps they should target nominal GDP. However, hardly anyone would dream of suggesting that monetary policy should help reduce government debt, by lowering interest rates or raising inflation. It is just accepted that we should only use costly (in welfare terms) increases in taxes, or costly cuts in government spending, to achieve debt reduction. What I have called the consensus assignment for economies with their own currency is that the central bank stabilises demand and inflation, and the government through fiscal policy manages government debt. The first part of that assignment does not work at the zero lower bound (ZLB), although some economists find it difficult to admit this. But equally there are circumstances where the second part of the assignment is far from optimal, and where it is useful to have the central bank help reduced debt. Circumstances like when debt is much too high. If we just think about the macroeconomics, where a benevolent policy maker operates both monetary and fiscal policy, then the reason is straightforward and pretty obvious. When debt is high, reducing real interest rates is a pretty effective means of getting debt down. If government debt is about the same size as annual GDP, then a reduction in the real interest rate on government debt of 1% is equivalent to raising taxes by 1% of GDP. If debt is only half the size of GDP, the same reduction in real interest rates is only equivalent to increasing taxes by half as much. The larger the stock of debt, the more effective interest rates are compared to fiscal instruments in reducing debt. Will reducing interest rates to cut debt not allow inflation to rise? Of course we are compromising our control of inflation. Fiscal instruments can be used to reduce this cost: if we cut government spending as well as cutting interest rates, the net effect on inflation may be small. But the key point is that inflation is not the only thing that matters. Raising taxes or cutting spending to reduce debt is costly too. So it may be better, in terms of social welfare, to let inflation rise for a time to get debt down than to have taxes rise to do the same. At this point you are probably thinking isn’t the whole point about the consensus assignment that monetary policy is much better at controlling inflation than fiscal policy? Yes it is in our benchmark models, but only when debt is not a problem. If we had some fairly painless way to control debt (i.e. lump sum taxes), then outwith the ZLB, monetary policy is indeed the best way to control inflation. But suppose instead that debt is much too high, and we need to bring it down (and there are no lump sum taxes). Suppose, as suggested above, that monetary policy is also the best way of getting debt down. In that case we are in a different world where comparative advantage applies. If you are still having difficulties with this - and because the consensus assignment has become such a consensus you might well be - imagine if debt was ten times GDP. In that case it is so much easier to get debt down by reducing real interest rates, it would be crazy not to. Any advantage monetary policy had in controlling inflation would pale into insignificance. If monetary policy is only a bit better at controlling inflation and much better at controlling debt, the latter should have priority. The reason why the idea of adding debt reduction to monetary policy’s tasks seems so taboo today is that we are concerned about the non-benevolent government. A government that spends too much and taxes too little can create ‘fiscal dominance’, and an inflation rate that is permanently too high. In extreme cases it can lead to hyperinflation. As is so often the case with fiscal policy (like the specification of fiscal rules), it is the non-benevolent policy maker which determines how we think about things. To some it will seem obvious that this should be so. Politicians can be trusted to do the wrong thing, particularly if it is in their interests. There are plenty of examples where this has happened in the past. However, many of us have been arguing that governments today seem if anything too eager to use fiscal policy to get debt down. We seem to have a twisted sort of fiscal dominance, where governments are reducing debt too rapidly, the economy is suffering as a result, yet monetary policy cannot effectively counter because we are at the ZLB. It therefore seems a little odd to be arguing that monetary policy cannot help bring debt down, because that would let fiscal policy makers off the hook. In countries like the UK, USA or the Netherlands, there is no hook, but policymakers are taking unpopular measures to get debt down nevertheless. Would they really do a complete about face if monetary policy lent them a hand? Now with short interest rates at the ZLB, and in the US and UK with Quantitative Easing directly reducing interest rates on government debt, it would appear as if there is no conflict at the moment between keeping inflation on target and reducing real interest rates. (Although this does not stop some getting very worked up when the central bank helps to reduce current borrowing.) However there are two parts to real interest rates. To the extent that monetary policy could be more expansionary today, but at the cost of higher inflation, it could be helping to reduce debt. If it is not, and the government is benevolent, monetary policy is probably behaving sub-optimally. These are taxes which have no impact on incentives, and so do not reduce output when raised. Although Miles Kimball has written what seems like a lament to their absence, when Mrs Thatcher tried to introduce them in the UK it led to her downfall. This is also true if we are quite happy to let debt permanently rise and fall in response to shocks, as Eser et al show. Noah Smith has a depressing look at the reaction of some graduate students to the macro they are taught. He links this to the ‘war’ between freshwater and saltwater visions of macro, and any disconnect between what is taught and the real world is bound to be more acute with the former. Particularly today, courses that attach New Keynesian theory to the end of the programme - and in some cases (through accident or design) end up not teaching it at all - are just asking for trouble. Even in more normal times, isn’t it a good idea to give students some idea of what central banks think they are doing? - they might just want a job in one! However, even if you put this ideological problem to one side, I think there is a difficulty for anyone teaching graduate macro, which is rather different from anything encountered teaching at the undergraduate level. At the masters level it is just logical to delay teaching New Keynesian economics until some way into the course. As is frequently said, New Keynesian theory is an elaboration of the RBC construct, so all that needs to be done first. To take the example of Oxford’s MPhil, we do the Ramsey model, RBC, OLG, growth theory, and the flex price open economy all before New Keynesian economics, and it makes sense to do it this way. Now this would not be a problem if this other stuff was as obviously interesting and relevant as Keynesian economics is today. However I fear that it is often not presented as such. Take growth theory for example. Now in principle this is all about why some countries are rich and some poor, which should be attention grabbing. But if in practice it amounts to discussing whether the speed of catch up is consistent with the Solow model, it can appear rather irrelevant. With the Ramsey model, I suspect the question of whether the allocation is optimal was not quite what students really wanted to know when they started the course. And if you do not teach the RBC model as the way to explain the business cycle, there is not that much to get excited about. The problem of lack of motivation is compounded by something that I think those teaching micro often fail to appreciate. Today graduate macro is intrinsically harder than micro. In terms of the techniques involved it is probably no more or less difficult, but what in my experience students find really hard is that everything we teach fits together. Yet until you have done everything it is difficult to understand why we choose to focus on some model features to discuss some issues, but on other aspects of the macroeconomy when talking about different issues. Motivation is useful when the subject is challenging. Luckily I think recent events, and specifically the debates over how quickly to reduce government debt, have come to the rescue. I mentioned in a footnote to a recent post how this year I was experimenting with starting the macro course with the two-period OLG model, instead of first developing the Ramsey model. This has a straightforward advantage, which is that students are familiar with the two-period consumption model from their undergraduate training, so we do not have to hit them with Hamiltonians quite so soon. However I think the main plus is that it allows us to focus on government debt and intergenerational equity right at the beginning of the course. There is an obvious interest among students in debt and intergenerational equity, but the crowding out effects of government debt on capital and therefore output in the simple two-period OLG model (with no wage income in the second period) are also dramatic. Almost certainly overstated as well, but better to start here than with a model where government debt does not matter at all! I can even bring in recent blog debates. We will see at the end of the year whether this turned out to be a good idea. Even if it is, I am still searching for the equivalent motivation when presenting the basic ideas behind flex price new open economy macro. What determines international competitiveness, its relationship to PPP, non-traded goods and home bias are all things students should know about, but I’m not sure it really grabs their attention. Any ideas will be gratefully received. We all know what countercyclical fiscal policy is. An expansionary policy is increasing government spending, or cutting income taxes, or maybe some other tax. Oh, and its temporary, paid for by raising debt. So we have to say how the debt is financed (or maybe paid off in the future). Which means cutting future government spending, or raising future taxes of some kind. Well that makes a large number of combinations. And then there is this balanced budget fiscal expansion idea, which does not involve debt at all. Now this multitude of possibilities would not be a problem if they all produced the same answer (the same multiplier). But they do not. I’ve talked about the various possibilities in a post before, but if you want it all done properly (as modern macro defines properly), see Denes, Eggertsson and Gilbukh (earlier version here). Now this may be fine for macroeconomists like me, because we can appear wise given this apparent confusion. But it allows others to say ‘theory is all over the place on what the multiplier is’, which is misleading. The problem is that we have not defined the policy properly. The source of the confusion is two-fold. First, fiscal policy involves many possible instruments, and balanced budget changes in the instrument mix can have significant effects on output. Second, because a frequently discussed option involves increasing debt and never paying it off, but just paying the interest, temporary changes in one instrument can be associated with permanent changes in another. In particular, an option often considered is a temporary increase in government spending financed by a permanent increase in debt, financed by permanently higher income taxes. As I have remarked before, this policy combination is like a red rag to a bull, where the bull believes Keynesians just want to increase the size of government and raise taxes. So how to improve things? Here is my suggestion. Let us define ‘pure’ countercyclical fiscal policy as a temporary change in some fiscal instrument, financed by changing debt, and that this debt is subsequently paid off or financed using the same instrument. So, if we raise government spending now, we payoff/finance the increase in debt by cutting government spending later (and not by raising any taxes). Now that does not make all multipliers the same, but it allows us to talk unambiguously about the government spending multiplier, or the income tax multiplier, and know exactly what we mean. Its great advantage is that, in considering the government spending multiplier for example, we do not need to address the issue of what impact any particular tax has on demand or supply at any particular time. The macroeconomics is simplified. An alternative would be to denote one particular fiscal instrument as the residual means of finance. So, for example, it is always income taxes that pays off/finances any debt created by any particular fiscal expansion. That would also allow us to talk unambiguously about particular multipliers, but it more complicated in macroeconomic terms. We need to know what the impact of changing taxes is, even if we start by increasing government spending. Now this complication might be inevitable if policy makers have an instrument which they think of as the residual financing tool, but I do not think they do. A final problem with this approach is that it confuses two quite different issues: changing the timing of fiscal instruments, and changing their composition. One possibly controversial aspect of my definition is that it excludes the balanced budget multiplier from the definition of countercyclical policy. But I see no problem with that. Both permanent and temporary compositional changes in the government’s fiscal mix may have important impacts on the demand for or supply of output (and inflation directly if they involve tax switches). The balanced budget multiplier is a particular type of temporary compositional change in fiscal policy. So I like my proposed definition of pure countercyclical fiscal policy. It does not stop us analysing, or indeed recommending, more complex policy combinations, but I think any analysis would be improved by clearly thinking about such policies in two parts: a pure countercyclical policy that is just about timing, combined with some additional compositional change. I recently noted the exchange between Jonathan Portes (Director of NIESR) and Jesse Norman (Conservative MP for Hereford) on the Treasury Select Committee. Now reading too much into transcripts of oral evidence can be dangerous: people often do not say quite what they mean, and I’m not a fan of gotcha type political journalism that makes a big deal of such inexactitude. However Dr. Norman, formally a philosophy fellow at UCL, has now clearly set out the reasoning behind his complaint, which I think is rather revealing. 1. Economics is not an exact science. Its substantive claims can only ever be more or less probable, though that probability can sometimes confer knowledge. 2. So: absolutely categorical statements—statements like “all of the interest rate differential was due to low economic activity, and none due to government policy” or “Plan A is failing” cannot be purely economic in character. 3. Those in positions of public authority should be capable of being held to account. This applies to politicians of course—but also to civil servants and academics. 4. As Director of NIESR, Jonathan is in a position of public authority. Indeed NIESR is an academic institution (NB its website is www.niesr.ac.uk), and so subject to academic standards of rigour; as well as partly or wholly funded by public money. There is no disagreement on (3) and (4), although note that his arguments apply to all academics (like me and other academic bloggers) and not just directors of well known public institutions. I would also agree with (1), if claims are about the real world rather than models of the real world. So Dr. Norman’s problem, to paraphrase, is that Jonathan should have said ‘Plan A is probably failing’ rather than ‘Plan A is failing’. Would you class the second as economics, but the first as a political attack on the banks? So why is Dr. Norman so keen that I or Jonathan Portes insert all these qualifiers to what we write? Well lets just imagine what might happen if I take Dr. Norman’s advice, and if I am ever asked to appear in front of the Treasury Select Committee again. The reality of course is that most people now realise Plan A has failed, and those that cannot admit that only have low interest rates to point to as any kind of success. So when macroeconomists point out that interest rates would be expected to be low for an economy that is so depressed, and that the experience of certain Eurozone countries just does not apply to us, these economists become dangerous voices that need either to be discredited as partisan, or intimidated into silence. Such tactics can be quite effective when used against an organisation as timid as the BBC: lets see if it can also work with an institution like NIESR. The more normal criticism by politicians of economists is the opposite, which is that we are always hedging. ‘Give me a one-handed economist’ President Harry Truman is reported as saying. Although I used this post from Chris Dillow as an excuse to talk about a particular problem with looking at ex post estimates of cyclically adjusted budget deficits, I did not address the main issue of his post, which is how the government budget deficit should respond to private sector financial imbalances. As Rich Clayton points out in comments, the issue raised by Chris is important, and it has been raised by others , but I’m not sure there are any simple answers. Suppose the private sector runs a surplus or deficit, which has nothing to do with the business cycle (i.e. it runs a cyclically adjusted surplus or deficit). Should the public sector attempt to match this by running a deficit or surplus (so the national surplus or deficit is much smaller), or should it focus on doing the right thing in relation to the stock of government debt. If the government has a fixed debt to GDP target, for example, should it try to keep to that target, even though the private sector is running a surplus or deficit? This is equivalent to the question of whether the government should worry about current account surpluses or deficits that have nothing to do with the business cycle. There are examples where it would not be appropriate for fiscal policy to respond to private sector surpluses or deficits, which come from what is sometimes called the intertemporal approach to the current account. Suppose, for example, that the economy discovers a finite natural resource, which will temporarily boost output and incomes. Before the resource is extracted, the private sector (and therefore the current account) is likely to go into deficit because of any investment required for extraction, and because consumers will anticipate the income gains and borrow to smooth consumption. When the resource is extracted, the private sector should be in surplus as it builds up assets to prepare for when the resource runs out. In both cases it would make no sense for the government to try and offset these private sector financial imbalances, because they represent the optimal response to the resource discovery. Now consider the same example, but while the resource is being extracted the private sector does not run a surplus. Perhaps it wrongly believes the resource will last forever, or it is just very myopic. In this case you could argue that the public sector could compensate for the private sector’s ignorance or short-sightedness, and run surpluses on their behalf by raising taxes (or not cutting taxes with the revenue raised by taxing the resource industry). You could think North Sea oil and contrast Norway and the UK here. You could also think this involved the government being rather paternalistic, or alternatively wanting to pass on some of the benefits of the resource to future generations. Coming more up to date, consider this example. The financial sector for some reason becomes highly risk averse, making it very difficult for firms and consumers to borrow. Monetary policy succeeds in preventing any downturn in economic activity (by, for example, encouraging savers to save less), but the overall scale of credit constraints in the economy remains elevated. Fiscal policy could relax these constraints by cutting taxes. These tax cuts might have little impact on savers if they were fairly Ricardian, but they would help those who were credit constrained spend more. If we viewed the risk aversion by the financial sector as a distortion, then fiscal policy would be reducing the distortion, and thereby increasing social welfare. Now think about a situation where there is a housing bubble. Despite the best advice of economists and politicians, the private sector borrows to buy real estate because they believe prices can only go up. There is only modest inflationary pressure (house prices are not in the CPI), and the monetary authorities successfully deal with it with small increases in interest rates, but these do not prick the bubble. There are no macroprudential controls. Should the fiscal authority run surpluses in this case? There is a large literature on whether monetary policy should deviate from the inflation target to try and prick the bubble (I discussed a recent contribution here), but it generally takes fiscal policy as given. Should it be? There are even clearer theoretical examples where fiscal policy is the appropriate tool, although they are of less obvious practical relevance. A shift in the monopoly markup of prices over costs (a ‘cost push’ shock) can be exactly offset by changes in tax rates or subsidies (zero additional social costs), whereas monetary policy can only balance additional social costs between inflation and output. Of course varying some particular fiscal instrument is not the same as changing the budget deficit. However if the distortion was temporary (e.g. a housing bubble), and some tax was changed temporarily to counteract it, then there are good tax smoothing reasons why you would not want to change other taxes (or raise spending) to offset the impact on the public accounts. So there seem to be examples of where it might make sense to run fiscal deficits (surpluses) to partially offset private sector surpluses (deficits), but also examples where it does not. To sort out which is which we need to ask what the distortion or friction is (if any) that is giving rise to the private sector imbalance, and whether there are appropriate fiscal instruments that act on similar margins that could offset the distortion. In other words, we need to think about the microeconomics behind the macro. In both cases in response to the large corporate sector surplus that has emerged in the UK since around 2002. If the private sector runs a surplus, but the government is in balance, then the current account must be in surplus by identity. I must stress that no business cycle issues are involved. Forget the zero lower bound, and assume the central bank successfully moves interest rates such that the output gap is zero, and inflation is on target. This will be the case whatever fiscal policy does, so there is no traditional business cycle motive for any particular fiscal policy stance. Short sighted consumers will not be Ricardian. The National Institute (NIESR) is old enough to count as a venerable British institution. I am a governor of that institution. The National Institute relies on research funding from a number of sources, which includes many that are directly or indirectly funded by the government. So when an MP of the governing coalition suggests publically that this institution should stop doing its job because its findings have political implications I have a direct concern. I would suggest that it is Mr. Norman who has transgressed a line here. I have read a lot of what Jonathan Portes has written since he became director of NIESR in 2011. He and I obviously share the same views about Plan A and UK austerity, but on other issues that he writes about (like the impact of immigration) I have no particular views and can therefore be dispassionate. What strikes me about Jonathan’s writing is that he is not afraid to call a spade a spade, but he is also scrupulously careful to stick to the economics of an issue. That he is so good at that befits his previous experience as a senior civil servant working for governments of both major parties. NIESR has always been the leading independent macroeconomics think tank in the UK. Macroeconomic policy is central for any government, and therefore it is bound to be political in that sense. Previous directors of NIESR have been equally forthright in public when they thought that the government was pursuing the wrong macroeconomic policy - I remember the two that I worked under being highly critical of the monetarism of Mrs. Thatcher’s government. As Jonathan Portes points out in the transcript, his predecessor Martin Weale was a constant thorn in the side of Gordon Brown’s fiscal policy, and with good reason. In this sense, Jonathan Portes is continuing an honorable tradition, of running a politically independent think tank that is prepared to criticise the government when it thinks it is pursuing the wrong macroeconomic course. In today's world where think tanks often tend to have clear political agendas or allegiances, this is refreshing and publically valuable. There are two things that are worrying about Mr. Norman’s line of questioning. The first is that he appears to be suggesting that because the macroeconomic judgements Jonathan Portes makes have political implications, he should keep quiet about them, or at least lose them in a fog of caveats. The potentially more serious is that by not keeping quiet he “may not do the long-term well-being of the NIESR much good.” But perhaps Mr. Norman was just offering some friendly advice, and intimidation was the last thing on his mind. So it was thought that a monetary union reduces fiscal discipline, and therefore it needs to do something to reverse that. Hence the SGP. In the years after the formation of the Euro events seemed to confirm this model. Interest rates on government debt for all member countries tended to converge, and fiscal discipline was very hard to maintain. But the former now looks like an aberration, caused perhaps by a combination of a belief that no Eurozone economy would ever default, and a general pre-crisis downgrading of risk. What we now have appears to be precisely the reverse of the argument behind the SGP. Market discipline is too great: interest rates on government debt for certain Eurozone members are ‘too high’, leading to a danger of self-fulfilling default (De Grauwe). Markets react much more to increases in individual Eurozone members government debt than similar increases in other countries, mainly because the former do not have a ‘lender of last resort‘ - their own central bank. The ECB’s OMT is designed to counteract that tendency. An important distinction here is between conditionality ex ante and ex post a debt crisis. Conditionality ex post, when institutions or other countries provide loans the market will not provide, is inevitable. However the myramid fiscal rules that replace the SGP are ex ante, and apply to countries with no incipient debt crisis (like the Netherlands, for example). In the rest of the world, we have the IMF, and the only ex ante conditionality it imposes is the need to cooperate in Article IV consultations. Why is the Eurozone so different? One argument is that recent events show clear contagion within the Eurozone. Greek problems raised interest rates for other Eurozone members, in a way that might not happen to - say - South Korea if Japan defaulted. However I would suggest that this was largely due to uncertainty about what the ECB would do. To say we need the Eurozone’s fiscal rules because the way the Eurozone handles a debt crisis is unclear sounds lame indeed. Another argument is that if emergency loans are required, other Eurozone countries will suffer potential losses on those loans, so they have an interest in preventing crises ex ante. However exactly the same is true for the IMF and the rest of the world. Indeed, my own view is that it would be far better - post OMT - if any emergency loans for a future Greece were provided by the IMF alone, because that reduces potential conflicts of interest. A similar argument that I can imagine being made refers to the ECB and OMT. However, although I have misgivings about it, OMT does come with conditionality, so once again there is no obvious need for measures ex ante. Now of course you could argue that with OMT, the Eurozone goes back to the position pre-crisis, where market discipline on individual governments was reduced compared to outside the Euro. I think at that point the argument is getting rather desperate. So why is the Eurozone obsessed with its fiscal rules? I can think of one clearly bad reason. (Actually I can think of many bad reasons, but this post is already long.) Eurozone governments still do not know what to do if a future Greece emerges. 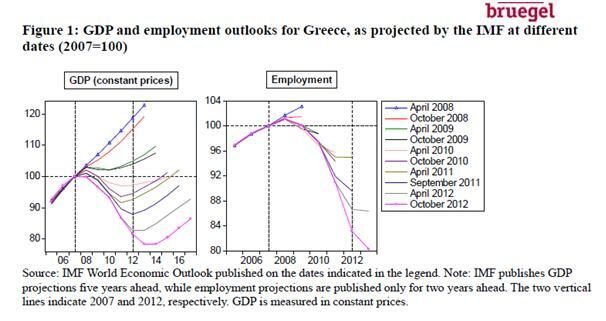 How does it differentiate between a future Greece (where default is required) and a future Ireland (where it is not)? The answer at the moment seems to be that the fiscal rules will ensure there will never be another Greece. That sounds like wishful thinking, particularly if other countries join. Unfortunately here the Eurozone has form. A common response before 2000 to those who argued that the Eurozone needed a strategy for dealing with asymmetric shocks was that this was not a problem because the formation of the Eurozone will itself eliminate asymmetric shocks. We all know what happened next. (1) Of course, if the goal is a European superstate, this is not a very interesting question. Given recent events, I do not think a European superstate is a realistic option, and even if it was I would be worried about governance issues. I should also emphasise that I am all for fiscal rules, backed up by independent fiscal institutions, at the national level. (2) Wherever there are spillovers from one country’s actions to another, there are potential gains from international policy coordination. Spillovers will be greater among union members. However I do not think the Eurozone’s fiscal rules can be classed as policy coordination. The debate about the size of the output gap (the difference between what output is now and what it could be without generating accelerating inflation) is taking place in most countries as we struggle to emerge from the Great Recession. This post is about how policy makers handle that uncertainty. If you think you are pretty sure what the size of the output gap is, you need read no further. The other possibility is that supply is somehow following demand. Now the concept that economists normally have of supply does not do this: we think of production functions with capital, labour and technologically determined productivity. There may be some endogeneity here: less demand leads to less investment, which reduces capital a bit, and if innovation has to be embodied in new capital this can slow technical progress. Perhaps in recessions where wages are low, people want to work less. But the evidence from previous business cycles is that this endogeneity is not large enough to make supply largely follow demand. In normal business cycle downturns, firms report that they have plenty of spare capacity and inflation falls. Keeping things simple, we can think of two policy responses. The ‘pessimistic’ response is to assume that underlying productivity growth really has slowed, while an ‘optimistic’ response would hope that once demand gets going, supply will follow. Although this issue is normally discussed in the context of monetary policy, long term fiscal plans also depend (in a rational world) on estimates of long term output (i.e. on supply) rather than short term movements in demand. In the UK there is a target for the future cyclically adjusted budget deficit. Last year we saw the OBR revise down its estimate for underlying supply, and future fiscal plans were tightened as a result. They could well do the same again quite soon (see this recent study from the Social Market Foundation). Which response we choose (or more realistically, lean towards) depends in part on which view about supply we think is more probable. But it should also depend on the size of the mistake that will be made if this belief is wrong. The mistake we make if we adopt the optimistic view and go for expansionary policy but it turns out supply has indeed fallen is straightforward: we get inflation without any additional growth. The mistake we make if we are pessimistic and pursue a more contractionary policy is more unusual. If supply follows demand, and yet we adjust demand to match supply, we run the danger of self-fulfilling pessimism. In monetary policy we focus on inflation rather than the output gap, and because inflation is sticky, the output gap steadily falls away without any above trend growth, and inflation stays near target. With fiscal policy we cut future spending to match lower expectations about supply, but expectations about future government spending influence spending decisions today, reducing demand and therefore supply. So how costly is each mistake? Higher inflation without higher growth is not good, but fortunately we will see it when it happens, and we have a well tested tool with which to deal with it - raising interest rates. So we will get a year or two of above target inflation. The mistake on the other side is potentially much larger, for two reasons. One I have talked about before: at the zero lower bound, it is more difficult to raise demand once we realise the mistake. The other is the more worrying. It may take some time before we see the mistake. At some point we will realise that we could have had GDP a good few percentages points higher than we did for a good few years, without a significant increase in inflation. But it might take some time for that realisation to occur. (For example, an unexpected positive demand shock that does not raise inflation.) That could lead to a cumulated percentage output loss in double figures. These are lost resources that we will never get back. There is an even worse outcome, which is that although supply might be elastic to demand in the short term, it becomes less so as demand stays low. In this case the cost in terms of lost GDP might continue forever. In these circumstances, it seems to me that policy should lean towards being optimistic about supply, even if we are somewhat sceptical that it is really following demand - because the costs of self-fulfilling output gap pessimism could be so high. This has some similarities with the position policymakers found themselves in during 2010. Although the chances that markets would suddenly stop buying government debt in countries outside the Eurozone seemed small even then, the scale of the damage if they had done so was thought sufficiently large that it justified switching to austerity. I have always thought that this reaction was quite understandable, and my main quarrel has been that positions were not changed when it became clear during 2011 that this risk was negligible. If policymakers were highly risk averse then, a similar attitude should make them very worried about self-fulfilling output gap pessimism today.